Once you have successfully added a Wallet, you can click Top up from the green top bar menu or from Dashboard > Top-Up your Wallet > start to fund it with money. One on the top up page, you must choose the wallet you want to fund. Click continue to to enter the amount. Click Cancel if you do not wish to do the top. Moving the up and down arrow keys on your keypad. Click continue to pay the amount entered into your wallet. When you are ready to pay, you have to select from the list of payment options. If you have multiple wallets, you can transfer funds from one to the other without any cost. Note: You have to have money in your wallet to be able to transfer to another wallet. You can choose to make a bank deposit at any of our partner banks. There are so many of them. To make this process easy for your, you can tell us where you are or manually select your area from a list. Click on Use My Location box to enable us use your PC’s locations to find our partner banks around you. Your must share your location with us to enable us find the banks around you. Learn how to enable your location on your PC. 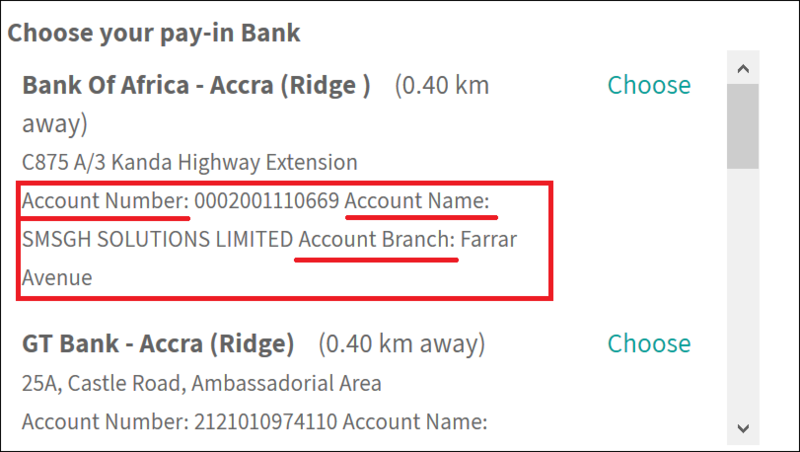 Once your location is shared, you will see the list of our banks with the following details. Bank Name – This is the name of the bank. Eg. Bank of Africa. Bank’s Location – This is the area the bank can be located. Eg. Accra (Ridge). Account Number – This is SMSGH account number with the bank. Account Name – This is name of our Account at the bank – SMSGH SOLUTIONS LIMITED. The Bank’s Branch – This is the branch where we(SMSGH) have our account with the bank. Account ID. This helps us to know that you are the one who made the payment. We advise you use this account id for as the name of the person who made the payment. We are able to verify the payment faster this way. 4. Pay in at the bank with these details. You should only proceed with the next steps below, if you have made the payment at the bank. 5. Once you have paid at the Bank, Follow the steps for funding your account but this time click on choose, to select the Bank where you made the payment. 6. Enter the name you used as the one who made the payment at the bank. If you used your account id, enter your account id. 7. Click Continue, so you can complete the process of funding your account. Click on Choose Location box. When your area shows up in the list, select your area. Click OK when you have selected your area. You will see the list of our partner banks with the following details. 6. Pay in at the bank with these details. You should only proceed with the next steps below, if you have made the payment at the bank. 7. Once you have paid at the Bank, Follow the steps for funding your account but this time click on choose, to select the Bank where you made the payment. 8. Enter the name you used as the one who made the payment at the bank. If you used your account id, enter your account id. 9. Click Continue, so you can complete the process of funding your account. Make sure you have enough money in your your Tigo, Airtel or MTN mobile money wallets. Access your SIM card toolkit (this can be found in tools on older phone versions). Follow the steps for Mobile money transfer. 5. For the last step, always enter the phone number you used to make the transfer. If you paid through a Merchant, please enter the merchant’s number. This is to help us easily identify your payment. 6. Click Continue, so you can complete the process of funding your account. The last process for topping up your wallet is to confirm payment. Every payment is confirmed before your account is topped up. Your payment will be pending until confirmed. Click Finished when you are sure you have made the payments using any of the payment options provided. Watch the video below to learn how to complete the process of topping up from a Bank. Loan top up is subject for approval. Type 4 for My Account option. Type 1 to Request for Top up. We will get in touch with you to confirm you request.